The award-winning Finding George Orwell in Burma is a non-fiction account of a woman who retraces George Orwell’s footsteps during the five years he served as a colonial police officer in what was then a province of British India. After his return to Britain in 1927, George Orwell (whose real name was Eric Blair) wrote a scathing account of colonial rule called Burmese Days, as well as the dystopian classics Animal Farm and Nineteen-Eighty-Four – the latter of which depicts a society shackled by its extreme authoritarian rulers. Recounting her visits to Yangon, Twante, Pyin Oo Lwin, Mawlamyine and Katha, where Orwell served as a police officer, the author shed new light on the creative influence Myanmar had on his later works and political outlook. Extensive interviews with sources – connected and unconnected to Orwell – also provide a glimpse into Burmese society during the 1990s and early 21st century, when it was truly Orwellian. Finding George Orwell in Burma was written by an American journalist who uses the pen name Emma Larkin. The author has never disclosed her identity and little is known about her, except that she was born and raised in Asia and that she studied Burmese in London. In an exclusive interview with Mizzima Business Weekly to mark the 10th anniversary of the publication of Finding George Orwell in Burma, Emma Larkin discusses contemporary Myanmar and explains why the time is not yet right to shed her nom de plume. Which came first – your interest in George Orwell or your interest in Myanmar? It was a case of both working in parallel. I’d read Orwell’s books and while I was travelling around Burma [during the 1990s] I developed more and more questions about the country that I couldn’t find answers to. His later books, such as Animal Farm, Nineteen-Eighty-Four and Burmese Days really spoke to me in a literary sense. I found his work very intriguing and came up with the idea to write a book about Orwell’s time in Burma and how it influenced his writing. In previous interviews you said that you would not disclose your identity to protect your sources and to be able to return to Myanmar. Is that still the case, 10 years on? Actually in terms of Burma, I think I probably wouldn’t need to keep a pen name anymore. However I’m working on a book about Thailand and things here are quite tense. As I live here permanently, it turns out it’s quite useful to have a pen name and I’d like to hang onto it for a couple more years. If you’d asked me just three months ago, I would have answered the question differently, but since the coup [on May 22] I need to be more careful than ever about protecting my identity – and it’s becoming increasingly difficult in this era of social media and what not. I was just talking to a friend about a protester who was arrested in Bangkok last month for reading Nineteen-Eighty-Four. I never thought that would ever happen in Thailand – it used to be Burma where something like that could occur. It’s very strange and worrying. How often do you visit Myanmar? Have you noticed a change in atmosphere since the transition to quasi-civilian rule in 2011? I’ve always lived in Bangkok, so Burma is close and I used to come about three or four times a year. But of late I’ve not done so as frequently because I’m working on my new book. My most recent visit was back in February. My last few trips have just been to Yangon and I can definitely see a dramatic change. One thing is that everyone is so busy – Yangon used to be a city stagnating but now it’s a city on the move. In the past, no one ever had anything to do except sit in a teashop. When I visit nowadays I’m lucky if I have 15 minutes with that guy! So that’s definitely a turnaround. However I’d need to travel outside Yangon to get a sense of whether change has really occurred. I suspect that life doesn’t feel very different in the villages. Are you and your sources cynical about the reform process in Myanmar? It’s funny to hear you say “sources” because I’ve known the people in my book for so long now that I think of them as my friends. In February people were – I don’t think cynical is the right word – but I would definitely say that the euphoria had died down and there was a general idea that perhaps not that much has changed in terms of day-to-day life. For the first two years after the reforms began there was great sense of excitement and energy, but I no longer see that. Referring to Finding George Orwell in Burma in an essay in 2008 called Being Eric/Being George: Or, What it’s Really Like to Become Someone Else, you wrote, “The book was a non-fiction account of life in Burma, a country ruled by a military dictatorship that is – I have to say it – truly Orwellian.” Have your views changed much since then? Burma is no longer an Orwellian state – if anything it would be Thailand. When I wrote about Burma there was extreme propaganda, censorship and the distortion of truth – that’s no longer occurring. Wikileaks and whistleblowers such as Snowden demonstrate that there are still pockets of that which is Orwellian all over the world. Most biographers agree that Eric Blair chose to write under the pen name George Orwell out of a fear of failure. You adopted a pen name for purely practical reasons. Your book has won several awards but has it ever been hard to have to shun any public recognition for your work? I went to a boarding school in Britain and the headmistress there told me that I would never amount to anything. So yes, I would like her to know! But aside from that, I’m really quite happy with the way things are. I’m not an attention seeker and I prefer to write books rather to turn into the story itself. Have you ever published books under your own name? Yes I have. But they were not the kind of books I write as Emma Larkin. The fact that you have remained anonymous is something of a triumph over military intelligence and testimony to the strength of your network of contacts, inside and outside Myanmar. How do you think you’ve managed to stay under the radar for so long? I think what likely happened is that whatever local file was being kept on me may have been lost or scattered at around the time the former chief of [Military] Intelligence and then Prime Minister Khin Nyunt was placed under house arrest [in 2004]. There was so much else going on at the time – perhaps that’s why I was able to continue with my research. You have said your cover was nearly blown several times. Could you describe such an encounter? I was on a train once and I met a man who at the time I just thought was friendly and charming – he wasn’t in a uniform or anything. But I still took the precaution of getting off a station earlier than him. After checking into the hotel, I realised the man had checked into the room right next door to mine. Did you immediately check out of the hotel? I actually left the country. When I encountered these kinds of problems along the way I’d ask my friends what they thought I should do. They told me that as soon as I went to another hotel, the hotel staff would have to inform the police, as that was standard procedure back then, so they’d know exactly where to find me. That made changing hotels pointless – my friends told me to leave Burma, wait a while, and then return. How long did it take to research your book? Did the fact that you spoke Myanmar arouse suspicions? Did you ever interview Daw Aung San Suu Kyi? I saw her speaking outside her home but no, I never interviewed her. I would have been automatically blacklisted if I had. But actually, what I really admired at the time was the bravery of the normal people who came out to listen to her. Do you make anything of the fact that Winston, the name of the main character in Nineteen-Eighty-Four, is a popular name in Myanmar? I hadn’t thought of that! [Laughs] Yes sure, I have friends called Winston. But I think there are many old-fashioned Christian names in Burma that are still quite popular – Penelope also comes to mind. I think it’s just part of the country having been insulated in a sort of time warp for so many years, rather than there being any sort of connection to Nineteen-Eighty-Four. In your book, you write, “The only recorded memory of Orwell in Burma dates back to his time in Rangoon and doesn’t show him in the best light.” You then describe a Myanmar lecturer recalling that as a young boy, he and his friends were messing about and accidentally knocked into Eric Blair at Rangoon Railway Station. He retaliated by lifting his cane and almost hitting a child on the head with it, before whacking him on the back at the last minute. Others described him as “every bit the imperial officer.” Do you separate the man from the writer or do you think Orwell’s experience in Myanmar profoundly changed him? I think it’s important to remember that both Orwell’s maternal and paternal sides had served in the colonies – him doing so was expected and in his blood, you could say. But why he chose to serve in the police force mystifies me to this day. Why not the civil service? What does seem apparent is that his experiences in Burma changed him and enabled him to go back and write books that were critical of colonialism and totalitarianism. As for some of the attitudes he expressed while serving in Burma, well, I think he was a product of his times. For him to have stood out in a significant way from the chit-chatterers at the colonial clubs in Burma, who would complain about this and that, would have been very exceptional indeed. He was part of a very large colonialist system. Do you think Orwell joined the imperial police to find material for books? No, I don’t think he did. The great thing about Orwell is that every single thing he ever wrote has been published – even the things he wrote as a young boy. The Complete Works of George Orwell is a 20-volume series: of course ordinary people don’t own it but they can be accessed in libraries. So when I read the things he’d written before he left for Burma, I could see that it’s all there and that his motivations were straightforward and practical. Up until then his writing wasn’t political. It was the experience that changed him. Your book also reveals that George Orwell, who was born in India in 1903, had Anglo-Burmese cousins. Is there any chance he may have had Burmese blood? Some have hypothesised that there is an autobiographical element to the main character in Burmese Days, Flory, whose birthmark was teasingly referred to as a “having lick of the tar brush” and that he felt a sense of shame about this. 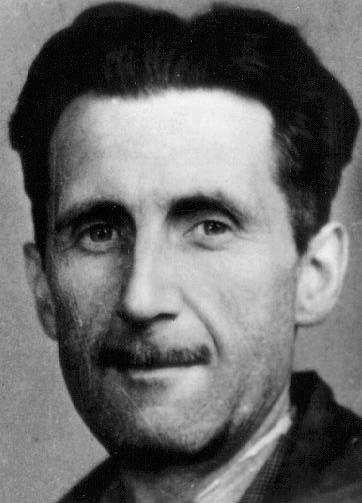 Orwell did have cousins who were Burmese – the birth certificates and marriage certificates have been found. A later biographer discovered a passport of his that had never been seen and it recorded the presence of blue tattoos on his hands that were inked in Burma. But as to whether Orwell had Burmese blood is a far less likely possibility. I’m cautious about reading too much between the lines of his work. But it would be interesting to talk more to his relatives and I hope that more archive material will become available in the future so that we can learn more about him. You say “Burma” as opposed to “Myanmar” – why is that? For me it’s not a political issue but a grammatical problem. We don’t say, for example, that a person is “America” and their language is “America” so for me it’s problematic to say “Myanmar people” and “Myanmar language.” So until that’s sorted out I will continue to use Burma. Other books by Emma Larkin include Everything is Broken: The Untold Story of Disaster Under Burma’s Military Regime (2010). Dear Jessica, I would like to get in contact with Emma. Can you make an introduction? Sure I understand. Please feel free to pass on my details. Thank you for this informative interview, great questions! I have just finished her excellent book on Orwell. Will look forward to the others! Ah, I should have Rose! I guess she has lots of people around her who are very good at keeping a secret!! Excellent interview. Love your blog posts!